Hollywood hype aside, close encounters of a rocky kind are fairly common. But they’re fascinating to local scientists who want to learn how it all began, and maybe fend off armageddon. At 4:33 a.m. on a recent Friday, Timothy Spahr was startled awake by a beep from his cellphone: A text message alerted him that a rocky object was hurtling toward Earth. He told his wife it was “some asteroid thing’’ and went to check his computer. In Hollywood, this would be the opening scene to a doomsday movie. But for Spahr, director of the Minor Planet Center at the Harvard-Smithsonian Center for Astrophysics, it is just another day. About once a month, an object on a potential crash course with Earth disturbs his slumber. They almost always miss — and this time was no different. The asteroid was just a few feet across and on track to miss by about 11,000 miles. He sent a note to contacts at NASA and posted information about it online. People have long been fascinated by the threat of apocalypse by asteroid, as depicted in movies such as the 1998 film “Armageddon’’ and 1979’s “Meteor,’’ which was inspired by an MIT student project to create a plan to avoid a theoretical collision. The screenplays are fictional, and the threat is improbable. Still, a small group of local scientists catalogs and tracks “near-Earth objects’’ — asteroids and comets — that could be hazardous. Astronomers are intensely interested in these rocks and ice flying by for basic scientific reasons, too — to learn about the origins of our solar system. Asteroids are essentially ancient chunks of scrap orbiting the sun — un assembled building blocks that never mashed together to form planets. (A meteor is the light created when a small object enters the atmosphere.) They have become of such interest that President Obama announced a plan last year to land astronauts on one by 2025 as a way of pushing manned spaceflight to unexplored scientific targets that are farther away than the moon. To answer those basic questions, scientists are learning as much as they can from ground observations. On a Sunday morning earlier this month, postdoctoral researcher Francesca DeMeo directed the movements of a telescope atop Mauna Kea in Hawaii from an MIT lab hung with festive foam meteorites. She talked with a telescope operator over a live video link and took measurements that will help her better understand the diverse makeup of asteroids, which can range from light chunks of carbon to solid iron. In a Cambridge office park about five miles away, Spahr called his team the “nerve center’’ for all observations of near-Earth objects, collecting sightings from telescopes around the world that arrive by e-mail. The Minor Planet Center, funded by NASA, receives up to 50,000 observations a day — some of nearby asteroids, but many that turn out to be in the main asteroid belt between Jupiter and Mars. Often, these are repeated sightings of the same object — measurements that allow scientists to more precisely calculate its projected path. 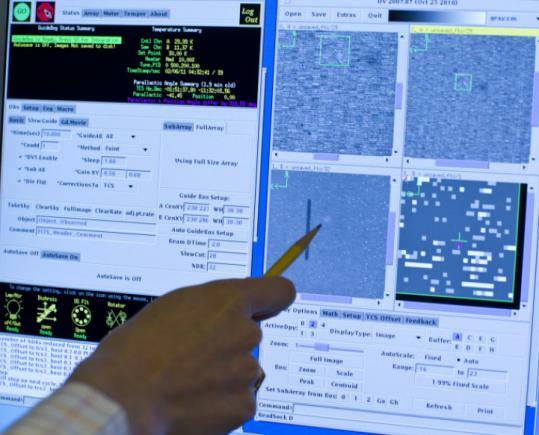 Those are shared with NASA, which calculates asteroid trajectories for the next century. Other researchers, at MIT’s Lincoln Laboratory in Lexington, hunt asteroids utilizing techniques initially developed to help the Air Force detect satellites. The Earth and the moon are pocked with the craters of long-ago collisions, but Binzel, a member of the Ad Hoc Task Force on Planetary Defense, a NASA advisory council, noted that asteroids were not always a topic of much scientific interest. He wrote his first paper on asteroids as a teenager in 1974, using a backyard telescope. Then, they were the “vermin of the sky,’’ he said — drawing astronomers’ annoyance because of the blurry streaks they left on long-exposure pictures of the night sky. Gradually, interest in the area grew. In the late 1980s, scientists proposed that a giant asteroid or comet impact killed off the dinosaurs. In 1994 fragments of the comet Shoemaker-Levy 9 slammed into Jupiter. Now, there are congressional mandates to catalog potentially dangerous near-Earth asteroids, and there are committees that mull over what to do if a threat is discovered. Most asteroids sit in the main asteroid belt. But others are in orbits that come close to Earth, and every day the planet’s atmosphere is pelted with small stuff, from 1,000 tons of dust a day to car-size objects about once a year. Most vaporize in the atmosphere, but occasionally one hits the ground. In October 2008, Spahr alerted NASA that a very small object would strike Sudan within 21 hours. It exploded in the atmosphere above the desert — where and when he predicted. Congress has directed scientists to find 90 percent of the near-Earth objects more than two-thirds of a mile in diameter, big enough to affect the global climate if they hit. As of the end of January, 822 of the estimated 1,000 nearby asteroids in that size range had been discovered. Scientists have also been tasked with finding 90 percent of those that are more than 460 feet in diameter, which could cause major regional damage. “If we find them 10 to 20 years in advance of a threatening encounter, we can do something about them — run a spacecraft into them to slow them down so in 10 to 20 years they miss the Earth,’’ said Donald Yeomans, head of NASA’s Near-Earth Object Program Office. Such sci-fi ideas spark the imagination, but everyone who works in the field says you are far more likely to die driving home from work than from an asteroid impact.